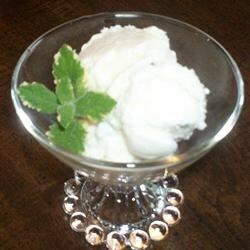 Greek yogurt with minted honey. Cold, smooth, and refreshing. Terrific for summer evenings. Garnish with mint sprigs, orange wheels, or strawberry slices. Stir together the yogurt and lemon juice until smooth in a freezer-safe metal bowl. Combine the honey and mint in a small bowl. Pour the honey on top of the yogurt, then give the yogurt a few quick stirs so that the honey forms "ribbons" in the yogurt but is not blended in completely. Cover bowl and freeze for 1 to 2 hours.